"America is at a historic turning point for automotive travel. Motor vehicles and drivers' relationships with them are likely to change significantly in the next ten to twenty years, perhaps more than they have changed in the last one hundred years." Many of the private industry and industry supported University R&D efforts will be eligible for Federal Research and Development tax credits. Eligible costs include employee wages, cost of supplies, cost of testing, contract research expenses, and costs associated with developing a patent. On January 2, 2013, President Obama signed the bill extending the R&D Tax Credit for 2012 and 2013 tax year. In 2002 Toyota introduced the first night vision equipped vehicle. This was an active night vision system that used infrared light and was available in the Lexus LX470 and Toyota Land Cruiser. It displayed an image of the road ahead on the windshield to help drivers see what the naked eye may not, greatly improving the safety of nighttime driving. Mercedes-Benz was the next company to incorporate this technology into some of its vehicles. The technology then evolved to utilizing passive systems based off infrared radiation emitted by the objects ahead rather than using an infrared light source. Passive systems allowed for greater range of vision. The newer system is now used by a wide range of manufactures including Audi, BMW, General Motors, and Honda. The next major innovation after night vision capabilities was Adaptive Cruise Control (ACC). Normal cruise control equipped in most modern cars allows the driver to set one selected speed for the car to maintain. If the traffic ahead slows the driver needs to retain their attention to manage the speed on their own. ACC allows the user to pace their car to the car in front of them while setting a maximum speed limit of their choice. If traffic ahead slows then the drivers car will also slow, while maintaining safe following distance. Some manufacturers even allow for a 'Stop & Go' capability as well. 'Stop & Go' lets the driver keep the ACC on and will even work when in traffic where the only driver input needed is steering. Although not all manufacturers equip the 'Stop & Go' capability, it is still a strong step towards total autonomy of vehicles. Combining technologies like night vision and ACC allows for systems within cars themselves to possibly communicate and account for not only other vehicles but pedestrians and animals as well. Ford has built research vehicles with high-resolution unidirectional cameras that can see the road and the surroundings with greater ability than the driver as well as incorporating ACC in to some vehicles. Audi utilizes ACC with 'Stop & Go' capability as well as cameras built in the front, back, and sides of the vehicle to detect other vehicles, pedestrians, traffic signs, and a range of roadway information. Mercedes-Benz included night vision as well as ACC in recent models and has developed an "advanced driving assist" in its F125 concept last year, but has not confirmed plans for future vehicles. BMW incorporated full ACC with 'Stop & Go' in a portion of their current lineup as well as night vision on select 7-series models. New models also have the option of cameras mounted to the front bumper to assist in seeing around low-visibility/blind corners when attempting to enter or cross a street. General Motors has expanded their range of ACC capable vehicles as competition in the luxury segment has done. Although completely self-driving vehicles are still in development, many advanced vehicle control systems allow drivers to make more conscious and intelligent decisions on the road. Autonomous cars will have 360 degree sensors, which will eliminate vehicle-to-vehicle miscommunication, preventing cars from crashing. Improved V2V (vehicle-to-vehicle) technology will reduce injuries/fatalities, hospital stays, property damage, and other societal costs. Predictions are that by 2020, limited self-driving cars will be available and by 2025, fully automated cars will be on the public market. The "V2V safety technologies have the potential to significantly reduce automobile crash fatalities and injuries on our highways" says Mike Stanton, CEO of Association of Global Automakers. Driverless cars are expected to exponentially reduce highway traffic, and allow increased safety. According to a North Carolina State University (NCSU) and New Jersey Institute of Technology (NJIT) study the leading cause of injury-related deaths among 65-74 year olds are motor vehicle accidents. An increasing number of individuals are headed into this age for ADAS to protect all drivers. Systems supporting a need, including lane keeping and blind spot notification, are useful in preventing possible collisions. When a driver is equipped with a sensory/automated car, he becomes more aware of his environment, which greater prevents any potentially dangerous situations. Auto-manufacturers must make these systems simple and easy for any age group to operate in order to achieve the goals of reducing related incidents. Development of new ADAS and other systems will aid drivers and innovation related to further developing these systems will be eligible for R&D credits. NHTSA has set out three categories of vehicle technology concentration that will require substantial product innovation relevant for R&D tax credits. The categories are as follows. Division of labor and authority: assures that either the driver or vehicle is in control. Transition: transferring adequate control from driver to vehicle and vice versa. Override: Override requirements allow the driver to regain control of an automated system. Functional Safety: Defines the requirements for electronic controls. Failure Modes: Assess the failure severities. Failure Probability: The likelihood of failure to occur. Diagnostics: Enhanced capabilities that can self detect or predict failures of automated systems. 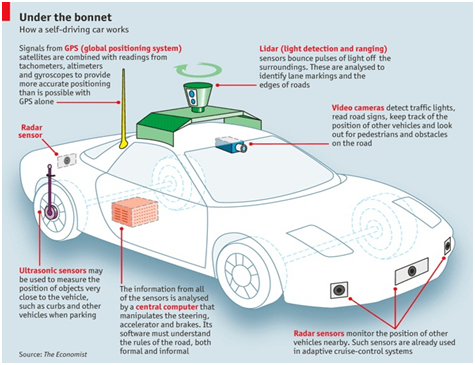 Redundancy: Investigating any additional hardware, software, or communications systems may be needed to ensure the safety of highly automated vehicles. Failsafe: Ability to execute even at a dismantled level in case of failure. Certification: Requirements to ensure system's safety at deployment and remain safe. Security: Competency of system to resist cyber attacks. Risks: Possible gaps in system compromised by cyber attacks. Detailed Functional Descriptions: Provides development for new level 2 and 3 operational models. Evaluate constraints on level 2 and 3 system performance. 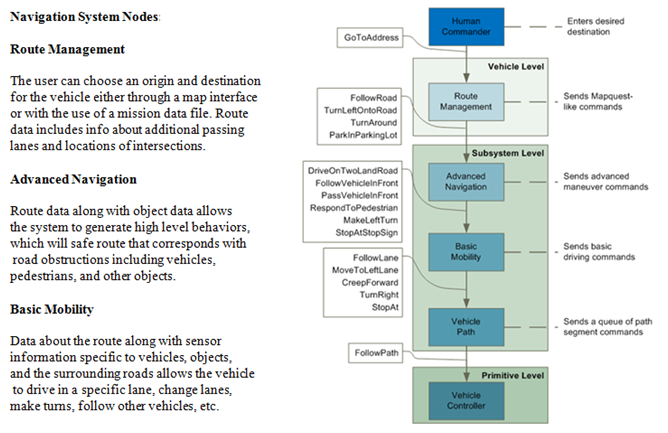 Data Analysis: Evaluate naturalistic and crash data to determine an array of real-world situations. Develop of test and evaluation requirements methods based on real world situations. Determine the performance and operating envelope for new level 2 and 3 systems. These systems include: maximum deceleration authority, maximum lateral velocity, maximum yaw moment, and other vehicle properties. Develop objective performance tests and pass/fail standards. Innovative new automotive technologies are being introduced to assist drivers and automate the driver experience as a whole. Federal and state R&D tax benefits are available and intended to encourage this high level of technological innovation. Christopher Zalesky is a Tax Analyst with R&D Tax Savers.